CANBERRA, Australia — A man arrested over the weekend in Sydney has been released without charge and was shocked to be questioned about a plot to bring down an airliner, his lawyer and police said Wednesday. Four Lebanese-Australian men had been arrested late Saturday by police who also reportedly seized a meat grinder that investigators thought may be the basis of a bomb. Abdul Merhi, 50, was released from police custody on Tuesday night, Australian Federal Police said. "This investigation remains ongoing and further information will be provided at an appropriate time," the police statement said. Merhi's lawyer Moustafa Kheir said his client had endured intense questioning. "There's a lot of stress associated there, and not knowing, and he was shocked that he was being questioned," Kheir said. The lawyer said Merhi's family was also in shock and his life had been "turned upside down" but he wanted to return to as normal a life as possible. "It's just unfathomable that he would be associated with anything like this," Kheir added. Prime Minister Malcolm Turnbull told reporters he would not draw any conclusions beyond one man's release. "I know my circumspection is disappointing, but you can understand there are very big issues of public safety at stake here so you'll forgive me if I'm circumspect. More will be said, more will be revealed, at the appropriate time," he added. A court has allowed police to hold the men for seven days without charge under counterterrorism laws designed to prevent an attack. Australian officials will not comment on reports that the arrests followed a tip from U.S. or British intelligence agencies that had intercepted communications from Syria. Australian authorities have said they thwarted a credible terrorist plot to down an airplane by smuggling a device onboard. They have provided few details, including the precise nature of the threat or any airlines involved. The United Arab Emirates' national airline said it is working with Australian police in the ongoing investigation, suggesting one of its planes may have been targeted in the plot. Etihad Airways, the smallest of three long-haul Gulf carriers that fly to Australia, refused to confirm, however, if it had been a target. 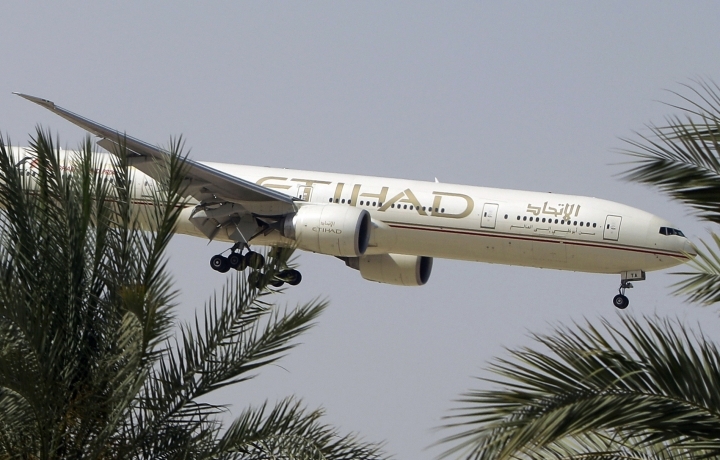 "The Etihad Airways aviation security team is assisting the Australian Federal Police with its investigation and the matter is ongoing," it said. "Etihad is complying fully with the enhanced security measures at airports in Australia and monitoring the situation closely. Safety is the airline's number one priority." Etihad operates direct flights to four Australian cities: Brisbane, Melbourne, Perth and Sydney. The airline has built strong ties to the country, buying a stake in alliance partner Virgin Australia, featuring Down Under stars including Nicole Kidman in advertising and sponsoring Melbourne's soccer team and its home stadium. Australian media outlets have reported that the conspirators wanted to target a flight to the Middle East, possibly the Emirati city of Dubai, but they failed to get the device onboard, so they changed their focus to an Australian domestic airline. Etihad's hub in Abu Dhabi is 130 kilometers (80 miles) from Dubai's main airport, the world's busiest for international flights. Dubai-based Emirates, the largest Mideast carrier, said it was cooperating on the additional security procedures but did not say whether it is involved in the investigation. Australia's Nine Network television reported on Tuesday that one of the suspects had tried to check in on an international flight, and that might have been a test run to see if they could get a meat grinder on board as carry-on luggage. Officials have refused to comment on media reports that the plot was to conceal explosives or chemicals that would emit toxic gas inside a piece of kitchen equipment.